Have you taken your bridle apart for a good cleaning? Putting your bridle back together isn’t complicated. These instructions are for putting together an English bridle, but many western bridles are similar. Start by doing up the buckles that hold the reins in the center. Western reins may not have a buckle, so just set them to the side for now. Lay your bridle so the throatlatch on the crown piece is down. The crown piece is the part that sits over the top or poll of the horse's head. On some western bridles the throat latch strap is separate, so you’ll need to lay out this piece too. Slip the browband on by pulling both the end of the throatlatch and the upper part of the cheek pieces through the loop. If there is a right side up to your browband, like a decoration of some type make sure you put it on at this first stage upside down. It will end up right side up once you’ve slid it around to the opposite side of the crown. Slide the browband all the way over the crown. Then insert the throatlatch through the top of the second loop on the browband. Straighten everything out, so it looks nice. Now you’ll be attaching the cheek pieces. The buckles on a bridle are always on the outside, away from the horse and all of the strap ends should point downwards. Do up the buckles and pull the ends of the straps down, putting them through the keepers, so they don’t flap. If you’ve used your bridle before, there will likely be wear marks where the buckles sat. Use those as guides so your bridle will fit your horse when you’re done. Next, lay out your cavesson. 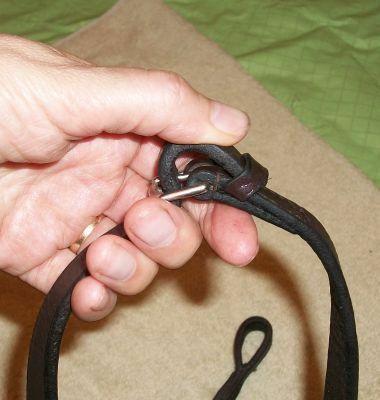 Insert the end of the strap of the cavesson through the loops of the browband underneath the crown. Pull the cavesson so the strap lies flat underneath the crown of the bridle. Do the buckle up on the cheek of the cavesson. Your bridle should look almost complete, just missing the bit and reins. Those little hook buckles (also called bridle studs) are as hard to do up as they are to take off. Slide the end of the strap through both keepers. Pull it so the hook is centered in the slot and push the hook through. Pull back on the leather so the hole settles around the post of the hook. Your bit will have a slight curve in the mouthpiece. As you attach it to the cheek pieces, you’ll want the curve up. That way it sits in the horse’s mouth comfortably. 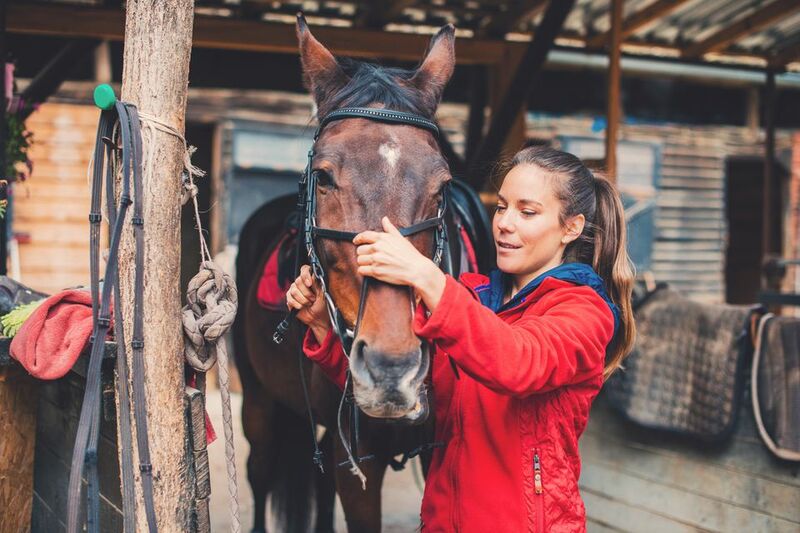 Check that you’ve attached it correctly by holding the bridle up as if you were going to put it on your horse, and see how the bit sits if it looks like a shallow U, change it around. Attach the reins underneath the cheek pieces. This completes your bridle, and it’s ready to put on your horse. Leave the nose band undone, to make it easier to put on your horse.